Some web developers host their pre-production development sites by configuring their DNS such that hostnames ending in .dev point to local servers. Such configurations were not meaningfully impacted when .dev became an official Generic Top Level Domain a few years back, because even as smart people warned that developers should stop squatting on it, Google (the owner of the .dev TLD) was hosting few (if any) sites on the gTLD. With Chrome 63, shipping to the stable channel in the coming days, things have changed. Chrome has added .dev to the HSTS Preload list (along with the .foo, .page, .app, and .chrome TLDs). This means that any attempt to visit http://anything.dev will automatically be converted to https://anything.dev. Other major browsers use the same underlying HSTS Preload list, and we expect that they will also pick up the .dev TLD entry in the coming weeks and months. Of course, if you were using HTTPS with valid and trusted certificates on your pre-production sites already (good for you!) the Chrome 63 change may not impact you very much right away. But you’ll probably want to move your preproduction sites off of .dev and instead use e.g. .test, a TLD reserved for this purpose. PS: Perhaps surprisingly, the dotless (“plain”) hostnames http://dev, http://page, http://app, http://chrome, http://foo are all impacted by new HSTS rules as well. “Magic” is great… except when it isn’t. Software Design is largely about tradeoffs, and one of the more interesting tradeoffs is between user experience and predictability. This has come up repeatedly throughout my career and in two independent contexts yesterday that I’ll describe in this post. I’m working on a tiny UX change to Google Chrome to deemphasize the data component of data: URIs. Oh, weird. It’s in an OS_MACOSX block, so I guess it’s not there for iOS. But how did it compile and only fail at linking? Hmmm… That’s a bit suspicious. There’s range_mac.mm and range_win.cc both listed within a single target. But it seems unlikely that the Mac build includes the Windows code, or that the Windows build includes the Mac code. Which suggests that maybe there’s some magic not shown in the build configuration that determines what actually gets built. And indeed, it turns out that such magic does exist. This meant that the iOS compilation had a header file with no matching implementation, and I was the first lucky guy to stumble upon this by calling the missing code. Talking to some of the experts, I learned that the long term goal is to get rid of the sources_assignment_filters altogether (No more magic!) but doing so entails a bunch of boring work (No more magic!). Magic is great, when it works. When it doesn’t, I spend a lot of time investigating and writing blog posts. In this case, I ended up flailing about for a few hours (because sending my various fix attempts off to the bots isn’t fast) trying to figure out what was going on. Git “magically” knows what I meant, and points out my mistake. Which approach is better? I suppose it depends. The code that suggests proper commands is irritating (“Dammit, if you knew what I meant, you could just do it!”) but it’s also predictable—only legal commands run and typos cannot go overlooked and propagate throughout scripts, documentation, etc. This same type of tradeoff appeared in a different scenario by the end of the day. The certificate’s SubjectAltNames field contains kubernetes.io, but not http://www.kubernetes.io. Basically, Chrome saw that the certificate for http://www.kubernetes.io was misconfigured and recognized that sending the user to the bare domain kubernetes.io was probably the right thing to do. So, it just did that, which is great for the user. Right? Right?? Well, yes, it’s great for Chrome users, and maybe for HTTPS adoption– users don’t like certificate errors, and asking them to manually “fix” things the browser can fix itself is annoying. But it’s less awesome for users of other browsers without this accommodation, especially when the site developers don’t know about Chrome’s magic behavior and close the bug as “fixed” because they tested in Chrome. So other browsers have to adopt this magic if they want to be as great as Chrome (no browser vendor likes bugs whining “Your browser doesn’t work but Chrome does!”). Then, after all the browsers have the magic in place, then other tools like curl and wfetch and wget etc need to adopt it. And the magic is now a hack that lives on for decades, increasing the development cost of all future web clients. Blargh. When you’re building magic into your software, consider carefully how you do so. Do you make your magic invisible, or obvious? Is there a way to scope it, or will you have to maintain it forever? Are you training users to expect magic, or guiding them away from it? If you’re part of an ecosystem, is your magic in line with your long-term ecosystem goals? Four weeks ago, emailed notice of a free massage credit revealed that I’ve been at Google for a year. Time flies when you’re drinking from a firehose. When I mentioned my anniversary, friends and colleagues from other companies asked what I’ve learned while working on Chrome over the last year. This rambling post is an attempt to answer that question. While I started at Google just over a year ago, I haven’t actually worked there for a full year yet. My second son (Nate) was born a few weeks early, arriving ten workdays after my first day of work. I took full advantage of Google’s very generous twelve weeks of paternity leave, taking a few weeks after we brought Nate home, and the balance as spring turned to summer. In a year, we went from having an enormous infant to an enormous toddler who’s taking his first steps and trying to emulate everything his 3 year-old brother (Noah) does. I mention this because it’s had a huge impact on my work over the last year—much more than I’d naively expected. When Noah was born, I’d been at Telerik for almost a year, and I’d been hacking on Fiddler alone for nearly a decade. I took a short paternity leave, and my coding hours shifted somewhat (I started writing code late at night between bottle feeds), but otherwise my work wasn’t significantly impacted. As I pondered joining Google Chrome’s security team, I expected pretty much the same—a bit less sleep, a bit of scheduling awkwardness, but I figured things would fall into a good routine in a few months. Things turned out somewhat differently. Perhaps sensing that my life had become too easy, fate decided that 2016 was the year I’d get sick. Constantly. (Our theory is that Noah was bringing home germs from pre-school; he got sick a bunch too, but recovered quickly each time.) I was sick more days in 2016 than I was in the prior decade, including a month-long illness in the spring. That ended with a bout of pneumonia that concluded with a doctor-mandated seven days away from the office. As I coughed my brains out on the sofa at home, I derived some consolation in thinking about Google’s generous life insurance package. But for the most part, my illnesses were minor—enough to keep me awake at night and coughing all day, but otherwise able to work. Mathematically, you might expect two kids to be twice as much work as one, but in our experience, it hasn’t worked out that way. Instead, it varies between 80% (when the kids happily play together) to 400% (when they’re colliding like atoms in a runaway nuclear reactor). Thanks to my wife’s heroic efforts, we found a workable daytime routine. The nights, however, have been unexpectedly difficult. Big brother Noah is at an age where he usually sleeps through the night, but he’s sure to wake me up every morning at 6:30am sharp. Fortunately, Nate has been a pretty good sleeper, but even now, at just over a year old, he usually still wakes up and requires attention twice a night or so. I can’t remember the last time I had eight hours of sleep in a row. And that’s been extremely challenging… because I can’t remember much else either. Learning new things when you don’t remember them the next day is a brutal, frustrating process. When Noah was a baby, I could simply sleep in after a long night. Even if I didn’t get enough sleep, it wouldn’t really matter—I’d been coding in C# on Fiddler for a decade, and deadlines were few and far between. If all else failed, I’d just avoid working on any especially gnarly code and spend the day handling support requests, updating graphics, or doing other simple and straightforward grunt work from my backlog. Things are much different on Chrome. When I first started talking to the Chrome Security team about coming aboard, it was for a role on the Developer Advocacy team. I’d be driving HTTPS adoption across the web and working with big sites to unblock their migrations in any way I could. I’d already been doing the first half of that for fun (delivering talks at conferences like Codemash and Velocity), and I’d previously spent eight years as a Security Program Manager for the Internet Explorer team. I had tons of relevant experience. Easy peasy. I interviewed for the Developer Advocate role. The hiring committee kicked back my packet and said I should interview as a Technical Program Manager instead. I interviewed as a Technical Program Manager. The hiring committee kicked back my packet and said I should interview as a Developer Advocate instead. The Chrome team resolved the deadlock by hiring me as a Senior Software Engineer (SWE). I knew I had a lot to learn, and fast, but it took me a while to realize just how much else I didn’t know. Beyond learning different operating systems, I’d never used Google’s apps before (Docs/Sheets/Slides); luckily, I found these easy to pick up, although I still haven’t fully figured out how Google Drive file organization works. Google Docs, in particular, is so good that I’ve pretty much given up on Microsoft Word (which headed downhill after the 2010 version). Google Keep is a low-powered alternative to OneNote (which is, as far as I can tell, banned because it syncs to Microsoft servers) and I haven’t managed to get it to work well for my needs. Google Plus still hasn’t figured out how to support pasting of images via CTRL+V, a baffling limitation for something meant to compete in the space… hell, even Microsoft Yammer supports that, for gods sake. The only real downside to the web apps is that tab/window management on modern browsers is still a very much unsolved problem (but more on that in a bit). While Telerik had an office in Austin, I didn’t interact with other employees very often, and when I did they were usually in other offices. I thought I had a handle on remote work, but I really didn’t. Working with a remote team on a daily basis is just different. With communication happening over mail, IRC, Hangouts, bugs, document markup comments, GVC (video conferencing), G+, and discussion lists, it was often hard to figure out which mechanisms to use, let alone which recipients to target. Undocumented pitfalls abounded (many discussion groups were essentially abandoned while others were unexpectedly broad; turning on chat history was deemed a “no-no” for document retention reasons). It often it took a bit of research to even understand who various communication participants were and how they related to the projects at hand. I’m working remotely, with peers around the world, so real-time communication with my team is essential. Some Chrome subteams use Hangouts, but the Security team largely uses IRC. Getting onto IRC remained on my “TODO” list for five months before I finally said “F- it”, installed HexChat on my Windows box, disabled automatic sleep, and called it done. It’s worked fairly well. When an engineer first joins Google, they start with a week or two of technical training on the Google infrastructure. I’ve worked in software development for nearly two decades, and I’ve never even dreamed of the development environment Google engineers get to use. I felt like Charlie Bucket on his tour of Willa Wonka’s Chocolate Factory—astonished by the amazing and unbelievable goodies available at any turn. The computing infrastructure was something out of Star Trek, the development tools were slick and amazing, the process was jaw-dropping. While I was doing a “hello world” coding exercise in Google’s environment, a former colleague from the IE team pinged me on Hangouts chat, probably because he’d seen my tweets about feeling like an imposter as a SWE. He sent me a link to click, which I did. Code from Google’s core advertising engine appeared in my browser. Google’s engineers have access to nearly all of the code across the whole company. This alone was astonishing—in contrast, I’d initially joined the IE team so I could get access to the networking code to figure out why the Office Online team’s website wasn’t working. “Neat, I can see everything!” I typed back. “Push the Analyze button” he instructed. I did, and some sort of automated analyzer emitted a report identifying a few dozen performance bugs in the code. “Wow, that’s amazing!” I gushed. “Now, push the Fix button” he instructed. “Uh, this isn’t some sort of security red team exercise, right?” I asked. He assured me that it wasn’t. I pushed the button. The code changed to fix some unnecessary object copies. “Amazing!” I effused. “Click Submit” he instructed. I did, and watched as the system compiled the code in the cloud, determined which tests to run, and ran them. Later that afternoon, an owner of the code in the affected folder typed LGTM (Googlers approve changes by typing the acronym for Looks Good To Me) on the change list I had submitted, and my change was live in production later that day. I was, in a word, gobsmacked. That night, I searched the entire codebase for misuse of an IE cache control token and proposed fixes for the instances I found. I also narcissistically searched for my own name and found a bunch of references to blog posts I’d written about assorted web development topics. Firefox has a similar system, but I’d’ve killed for something like this back when I was reproducing and reducing bugs in IE. While it’s easy to understand how the system functions, it works so well that it feels like magic. Other useful scripts include the presubmit checks that run on each change list before you submit them for code review—they find and flag various style violations and other problems. Compilation itself typically uses a local compiler; on Windows, we use the MSVC command line compiler from Visual Studio 2015 Update 3, although work is underway to switch over to Clang. Compilation and linking all of Chrome takes quite some time, although on my new beastly dev boxes it’s not too bad. Googlers do have one special perk—we can use Goma (a distributed compiler system that runs on Google’s amazing internal cloud) but I haven’t taken advantage of that so far. For bug tracking, Chrome recently moved to Monorail, a straightforward web-based bug tracking system. It works fairly well, although it is somewhat more cumbersome than it needs to be and would be much improved with a few tweaks. Monorail is open-source, but I haven’t committed to it myself yet. For code review, Chrome presently uses Rietveld, a web-based system, but this is slated to change to a different system called Gerrit in the near(ish) future. Like Monorail, it’s pretty straightforward although it would benefit from some minor usability tweaks; I committed one trivial change myself, but the pending migration to a different system means that it isn’t likely to see further improvements. As an open-source project, Chromium has quite a bit of public documentation for developers, including Design Documents. Unfortunately, Chrome moves so fast that many of the design documents are out-of-date, and it’s not always obvious what’s current and what was replaced long ago. The team does value engineers’ investment in the documents, however, and various efforts are underway to update the documents and reduce Chrome’s overall architectural complexity. I expect these will be ongoing battles forever, just like in any significant active project. My first check in to Chrome landed in February; it was a simple adjustment to limit Public-Key-Pins to 60 days. Assorted other checkins trickled in through the spring before I went on paternity leave. The most fun fix I did cleaned up a tiny UX glitch that sat unnoticed in Chrome for almost a decade; it was mostly interesting because it was a minor thing that I’d tripped over for years, including back in IE. (The root cause was arguably that MSDN documentation about DWM lied; I fixed the bug in Chrome, sent the fix to IE, and asked MSDN to fix their docs). I fixed a number of minor security bugs, and lately I’ve been working on UX issues related to Chrome’s HTTPS user-experience. Back in 2005, I wrote a blog post complaining about websites using HTTPS incorrectly, and now, just over a decade later, Chrome and Firefox are launching UI changes to warn users when a site is collecting sensitive information on pages which are Not Secure; I’m delighted to have a small part in those changes. Having written a handful of Internet Explorer Extensions in the past, I was excited to discover the joy of writing Chrome extensions. Chrome extensions are fun, simple, and powerful, and there’s none of the complexity and crashes of COM. My first and most significant extension is the moarTLS Analyzer– it’s related to my HTTPS work at Google and it’s proven very useful in discovering sites that could improve their security. I blogged about it and the process of developing it last year. More than once, I spent an hour or so trying to reproduce and reduce a bug that had been filed against Chrome. When I found out the cause, I’d jubilently add my notes to the issue in the Monorail bug tracker, click “Save changes” and discover that someone more familiar with the space had beaten me to the punch and figured it out while I’d had the bug open on my screen. Adding an “Issue has been updated” alert to the bug tracker itself seemed like the right way to go, but it would require some changes that I wasn’t able to commit on my own. So, instead I built an extension that provides such alerts within the page until the feature can be added to the tracker itself. Each of these extensions was a joy to write. I’m a diligent self-hoster, and I run Chrome Canary builds on all of my devices. I submit crash reports and file bugs with as much information as I can. My proudest moment was in helping narrow down a bizarre and intermittent problem users had with Chrome on Windows 10, where Chrome tabs would crash on every startup until you rebooted the OS. My blog post explains the full story, and encourages others to file bugs as they encounter them. I’ve been developing software for Windows for just over two decades, and inevitably I’ve learned quite a bit about it, including the undocumented bits. That’s given me a leg up in understanding bugs in the Windows code. Some of the most fun include issues in Drag and Drop, like this gem of a bug that means that you can’t drop files from Chrome to most applications in Windows. More meaningful bugs relate to problems with Windows’ Mark-of-the-Web security feature (about which I’ve blogged about several times). Google teams have the notion of sheriffs—a rotating assignment that ensures that important tasks (like triaging incoming security bugs) always has a defined owner, without overwhelming any single person. Each Sheriff has a term of ~1 week where they take on additional duties beyond their day-to-day coding, designing, testing, etc. I’m on two sheriff rotations: Enamel (my subteam) and the broader Chrome Security Sheriff. The Enamel rotation’s tasks are akin to what I used to do as a Program Manager at Microsoft—triage incoming bugs, respond to questions in the Help Forums, and generally act as a point of contact for my immediate team. In contrast, the Security Sheriff rotation is more work, and somewhat more exciting. The Security Sheriff’s duties include triaging all bugs of type “Security”, assigning priority, severity, and finding an owner for each. Most security bugs are automatically reported by our fuzzers (a tireless robot army! ), but we also get reports from the public and from Chrome team members and Project Zero too. At Microsoft, incoming security bug reports were first received and evaluated by the Microsoft Security Response Center (MSRC); valid reports were passed along to the IE team after some level of analysis and reproduction was undertaken. In general, all communication was done through MSRC, and the turnaround cycle on bugs was typically on the order of weeks to months. In contrast, anyone can file a security bug against Chrome, and every week lots of people do. One reason for that is that Chrome has a Vulnerability Rewards program which pays out up to $100K for reports of vulnerabilities in Chrome and Chrome OS. 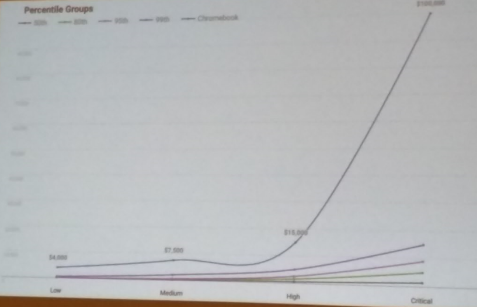 Chrome paid out just under $1M USD in bounties last year. This is an awesome incentive for researchers to responsibly disclose bugs directly to us, and the bounties are much higher than those of nearly any other project. With a top bounty of $100000 for an exploit or exploit chain that fully compromises a Chromebook, researchers are much more likely to send their bugs to us than to try to find a buyer on the black market. Bug bounties are great, except when they’re not. Unfortunately, many filers don’t bother to read the Chrome Security FAQ which explains what constitutes a security vulnerability and the great many things that do not. Nearly every week, we have at least one person (and often more) file a bug noting “I can use the Developer Tools to read my own password out of a webpage. Can I have a bounty?” or “If I install malware on my PC, I can see what happens inside Chrome” or variations of these. Because we take security bug reports very seriously, we often spend a lot of time on what seem like garbage filings to verify that there’s not just some sort of communication problem. This exposes one downside of the sheriff process—the lack of continuity from week to week. In the fall, we had one bug reporter file a new issue every week that was just a collection of security related terms (XSS! CSRF! UAF! EoP! Dangling Pointer! Script Injection!) lightly wrapped in prose, including screenshots, snippets from websites, console output from developer tools, and the like. Each week, the sheriff would investigate, ask for more information, and engage in a fruitless back and forth with the filer trying to figure out what claim was being made. Eventually I caught on to what was happening and started monitoring the sheriff’s queue, triaging the new findings directly and sparing the sheriff of the week. But even today we still catch folks who lookup old bug reports (usually Won’t Fixed issues), copy/paste the content into new bugs, and file them into the queue. It’s frustrating, but coming from a closed bug database, I’d choose the openness of the Chrome bug database every time. Getting ready for my first Sherriff rotation, I started watching the incoming queue a few months earlier and felt ready for my first rotation in September. Day One was quiet, with a few small issues found by fuzzers and one or two junk reports from the public which I triaged away with pointers to the “Why isn’t a vulnerability” entries in the Security FAQ. I spent the rest of the day writing a fix for a lower-priority security bug that had been filed a month before. A pretty successful day, I thought. Day Two was more interesting. Scanning the queue, I saw a few more fuzzer issues and one external report whose text started with “Here is a Chrome OS exploit chain.” The report was about two pages long, and had a forty-two page PDF attachment explaining the four exploits the finder had used to take over a fully-patched Chromebook. Watching Luke’s X-wing take out the Death Star in Star Wars was no more exciting than reading the PDF’s tale of how a single byte memory overwrite in the DNS resolver code could weave its way through the many-layered security features of the Chromebook and achieve a full compromise. It was like the most amazing magic trick you’ve ever seen. I hopped over to IRC. “So, do we see full compromises of Chrome OS every week?” I asked innocently. “No. Why?” came the reply from several corners. I pasted in the bug link and a few moments later the replies started flowing in “OMG. Amazing!” Even guys from Project Zero were impressed, and they’re magicians who build exploits like this (usually for other products) all the time. The researcher had found one small bug and a variety of neglected components that were thought to be unreachable and put together a deadly chain. The first patches were out for code review that evening, and by the next day, we’d reached out to the open-source owner of the DNS component with the 1-byte overwrite bug so he could release patches for the other projects using his code. Within a few days, fixes to other components landed and had been ported to all of the supported versions of Chrome OS. Two weeks later, the Chrome Vulnerability rewards team added the reward-100000 tag, the only bug so far to be so marked. Four weeks after that, I had to hold my tongue when Alex mentioned that “no one’s ever claimed that $100000 bounty” during his “Hacker Quantified Security” talk. Just under 90 days from filing, the bug was unrestricted and made available for public viewing. The remainder of my first Sheriff rotation was considerably less exciting, although still interesting. I spent some time looking through the components the researcher had abused in his exploit chain and filed a few bugs. Ultimately, the most risky component he used was removed entirely. Beyond working on the Enamel team (focused on Chrome’s security UI surface), I also work on the “MoarTLS” project, designed to help encourage and assist the web as a whole in moving to HTTPS. This takes a number of forms—I help maintain the HTTPS on Top Sites Report Card, I do consultations and HTTPS Audits with major sites as they enable HTTPS on their sites. I discover, reduce, and file bugs on Chrome’s and other browsers’ support of features like Upgrade-Insecure-Requests. I publish a running list of articles on why and how sites should enable TLS. I hassle teams all over Google (and the web in general) to enable HTTPS on every single hyperlink they emit. I responsibly disclosed security bugs in a number of products and sites, including a vulnerability in Hillary Clinton’s fundraising emails. I worked to send a notification to many many many thousands of sites collecting user information non-securely, warning them of the UI changes in Chrome 56. When I applied to Google for the Developer Advocate role, I expected I’d be delivering public talks constantly, but as a SWE I’ve only given a few talks, including my Migrating to HTTPS talk at the first O’Reilly Security Conference. I had a lot of fun at that conference, catching up with old friends from the security community (mostly ex-Microsofties). I also went to my first Chrome Dev Summit, where I didn’t have a public talk (my colleagues did) but I did get to talk to some major companies about deploying HTTPS. I’ve kept blogging since leaving Microsoft, and I’m happy that I have even though my reader count numbers are much lower than they were at Microsoft. I’ve managed to mostly avoid trouble, although my posts are not entirely uncontroversial. At Microsoft, they wouldn’t let me publish this post (because it was too frank); in my first month at Google, I got a phone call at home (during the first portion of my paternity leave) from a Google Director complaining that I’d written something that was too harsh about a change Microsoft had made. But for the most part, my blogging seems not to ruffle too many feathers. Food at Google is generally really good; I’m at a satellite office in Austin, so the selection is much smaller than on the main campuses, but the rotating menu is fairly broad and always has at least three major options. And the breakfasts! I gained about 15 pounds in my first few months, but my pneumonia took it off and I’ve restrained my intake since I came back. At Microsoft, I always sneered at companies offering free food (“I’m an adult professional. I can pay for my lunch.”), but it’s definitely convenient to not have to hassle with payments. And until the government closes the loophole, it’s a way to increase employees’ compensation without getting taxed. For the first three months, I was impressed and slightly annoyed that all of the snack options in Google’s micro-kitchens are healthy (e.g. fruit)—probably a good thing, since I sit about twenty feet from one. Then I saw someone open a drawer and pull out some M&Ms, and I learned the secret—all of the junk food is in drawers. The selection is impressive and ranges from the popular to the high end. Google makes heavy use of the “open-office concept.” I think this makes sense for some teams, but it’s not at all awesome for me. I’d gladly take a 10% salary cut for a private office. I doubt I’m alone. Coworkers at Google range from very smart to insanely off-the-scales-smart. Yet, almost all of them are humble, approachable, and kind. Google, like Microsoft, offers gift matching for charities. This is an awesome perk, and one I aim to max out every year. I’m awed by people who go far beyond that. Tip: The easy way to create a shortcut to the current page in app mode is to click the Chrome Menu > More Tools > Create Shortcut and tick the Open as Window checkbox. I now have SlickRun MagicWords set up for mail, calendar, and my other critical applications. So, that’s it for year one @Google. I’m feeling lucky as I head into year two!